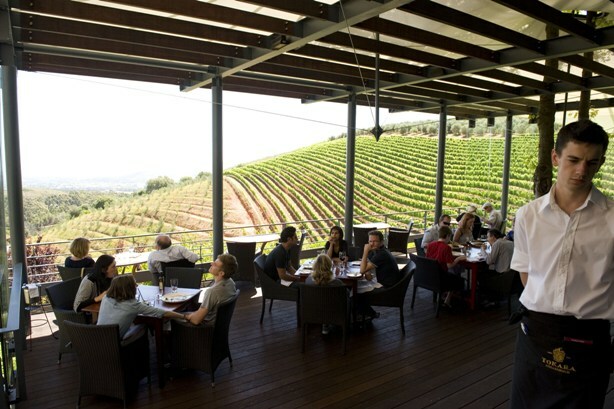 After prolonged renovations, Tokara restaurant re-opened, revitalised and with a cool air of self-assurance, in time for the summer season. Sheltered from the wind and facing west, the large wooden deck enjoys sunsets and an uninterrupted view that stretches from the Helshoogte Pass to Table Mountain in the background, with vineyards in the foreground and Stellenbosch university campus in the mid-ground. Every table has a view, but if there is a pair of you, try and book one of the half-moon tables along the railings facing out. Tokara belongs to merchant banker GT Ferreira. As you enter you’ll see some of his art collection – a marble fountain by Willem Strydom entitled Leauwendans, and a massive William Kentridge he commissioned taking up much of the back wall. There is a large fireplace for winters. The organic architecture with stone walls and earthy tones blends in harmoniously with the mountain. Ferreira opened the place a decade ago with chef Etienne Bonthuys, who made a name for himself in the 1980s by boldly bringing to South African restaurants a contemporary European take on sauce-based cuisine together with spectacular prices. Cape Town was once in awe of his Floris Smit Huis in Church Street. After a few years’ stint in Ghent, Belgium, he opened Bonthuys in the Bo-Kaap, decorated in the eccentric warehouse style then the mode of fine-dining rooms in Brussels. He was celebrated for his bizarre but surprisingly delightful pairings such as lamb with oyster or crayfish. Tokara was one of the most expensive eateries in the Western Cape, but it was also one of the few places that served a perfect zabaglione. I remember on my first visit hearing frenetic whisking coming from the kitchen, then ominous, deathly silence. Then whisking again. My dessert was the last one out to our table of six. Well, that’s zabaglione for you. The lunch prices are still steep (starters R65-80, mains R95-140, desserts R50-65), but not outrageous, except for the degustation menu (R1000 a head with premium wine pairings). 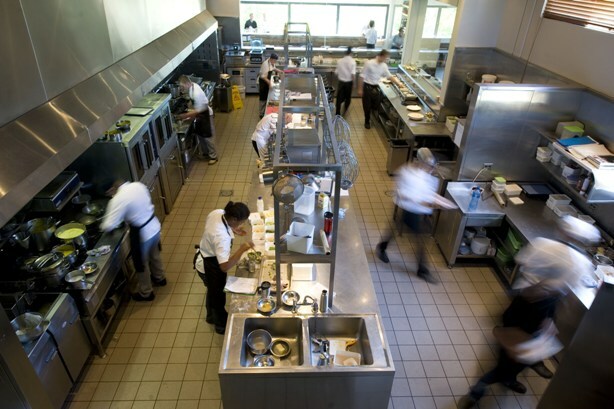 The new chef is Richard Carstens, who has a reputation for molecular cuisine. He isn’t going quite that route here at lunch times, though he enjoys his foams, gels, dehydrations, distillations, crystallizations and such. The plates are detailed, but not absurdly elaborate, and his a la carte lunch menu is even conservative, covering the bases: beef, lamb, ostrich, fish and poultry. Perhaps it is the influence of slow food, but the trend now is towards local produce and South African favourites. The wineland eateries have always been a bit more down to earth and rooted in the land than their city counterparts. The winelist however is extensive and has a large French inventory. For lunch one can be quite content with the Tokara Elgin sauvignon blanc, a superb wine from their highlands farm and a steal at only R105 a bottle. For starters it was between the double-baked feta cheese soufflé (R65) with watermelon or the chicken liver paté (R65), garnished with beetroot dice. The paté is flavourful and much lighter than most. The portion is pocketbook-sized and the two little rounds of bread are insufficient. The paté is too good to abandon, so use it up on the welcome bread. The main was a special that day, a pork belly (R135) cooked for 12 hours sous vide served on a bed of roasted red cabbage ‘kimchi’, with split blanched asparagus spears and papaya puree. The Elgin sauvignon was as partial to it as I was. Desserts are takes on the regular darlings of local sweet tooths, such as Cape brandy tart and tiramisu. The raspberry sorbet (R50) with white chocolate mousse, litchi, pistachio and rose seeds, looked as if it had been painted on the plate with free strokes by David Hockney. Throughout the meal, Carstens exploits an intense colour palette. He quite took my eye off that marvellous view, which is saying something. This article appeared in the Mail & Guardian on February 22. Tokara, R310 between Franschhoek and Stellenbosch, Tokara Winery, Helshoogte Pass, Stellenbosch. Open for lunch: 12:30- 2:30pm, Tuesday to Sunday and dinner 7- 10pm, Tuesday to Saturday. Tel: 021 885 2550.